Designing an HTML email that renders consistently across the major email clients can be very time consuming. Support for even simple CSS varies considerably between clients, and even different versions of the same client. CampaignMonitor has put together this CSS support in email clients guide to save you the time and trouble of figuring it out for yourself. With 21 different sets of results, all the major email systems are covered, both desktop applications and webmail. It comes with the PDF and Excel version for download. 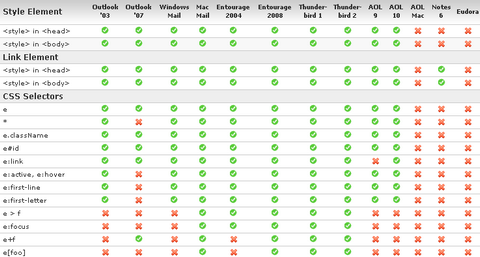 It’s interesting how, after 4 years of development, Outlook ’07 has *less* CSS support than ’03. You’ve gotta give Microsoft some credit here. It takes a rare talent to make money by giving your customers *less* features.